The River Sheoak in George Robinson Gardens will be listed on the Significant Tree Register. THE community is throwing its weight behind nominating local trees to the City of Mandurah’s Significant Tree Register with feedback at unprecedented levels. A number of submissions were considered when the council endorsed two nominations on to the register at its meeting last night. 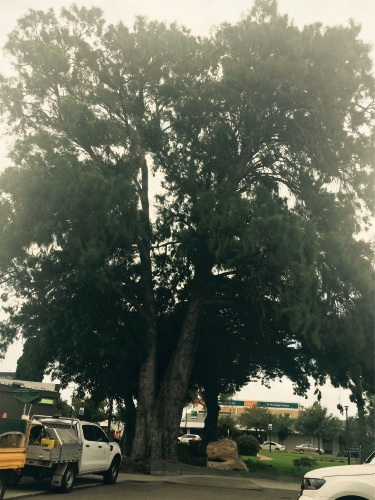 One, a more than 100-year-old River Sheoak (casuarina equisetifolia) is on the boundary of George Robinson Gardens and the Mewburn Centre carpark in the city centre. The other, a 150-year-old tuart (eucalyptus gomphocephala) is on public open space at Pinehurst Loop, Meadow Springs. The River Sheoak is an original planting from Mandurah’s first school that originally stood on the Mewburn Centre site in the late 1800s. But according to the council, the tree is located on a significant site that might in future be subject to development. The then council would need to make a decision based on the economic value of the development relative to the significance of the tree. The huge tree at Meadow Springs is a threatened species of a size and age that is becoming rarer. Mandurah MLA David Templeman was one of a number of individuals and business owners to provide feedback on the Sheoak. He said the tree was extremely important to the environmental aspect of the park and enjoyed by residents and tourists. The value of trees nominated for the register is assessed against criteria including visual significance, ecological and historical values. Eighty-one trees are currently listed on the register.